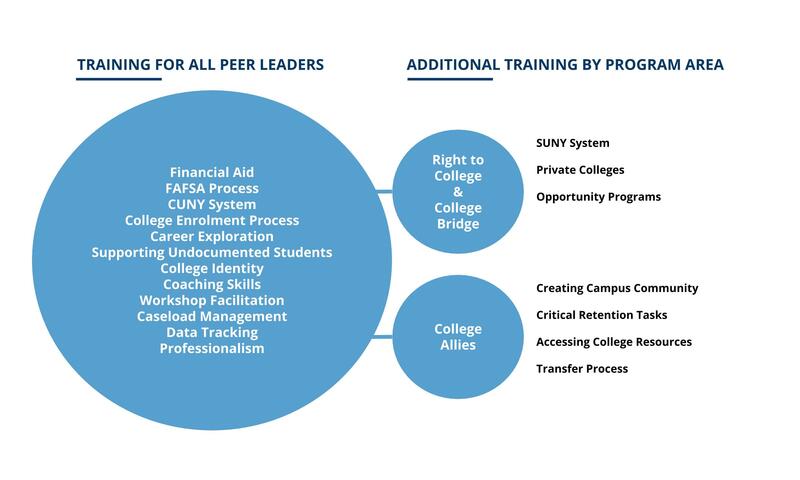 CARA's programs provide a range of solutions for college access and success. College Inquiry, CARA’s whole school model, works intensively with schools for 3-4 years helping them to build their college-going infrastructure and culture. By the end of our partnership, schools have built the capacity to continue this work on their own. CARA’s peer-led college access and persistence programs help first-generation college students in New York City define and realize their post-secondary aspirations with support from their peers, from application through persistence. Peer Leaders are carefully selected and rigorously trained high school and college students who work within their own schools and communities. They work along various points in the postsecondary access and persistence process, providing one-on-one counseling and group support to help their peers matriculate into and persist through higher education. What Do Peer Leaders Do? Access: Support 9th-12th grade high school students to make thoughtful and informed decisions about college, addressing questions like: What colleges would be a good fit for me? Can I afford to go to college? What do colleges look for in an applicant? How do I complete all the steps of the application process? Matriculation: Work with seniors throughout the year in order to effectively support them over the summer as they cross the bridge from high school to college and wonder: What do I do if I still haven’t received a financial aid package from the college I want to attend? What is a reasonable amount to take out in loans? What is a Master Promissory Note? Persistence: Support college students as they transition into and persist through college, confronting questions like: What can I do to feel a part of a community on my campus? How do I navigate these new systems I am expected to use? Who can help me when I am struggling with a class? What do I do if my financial status has changed when it is time to refile for FAFSA? All Peer Leaders receive 70+ hours of training. Trains and positions high school students to support their peers through the post-secondary planning process. Trains and positions college students to work in their alumni high schools assisting seniors’ application and matriculation process. Trains and positions college students to support their peers in college through the obstacles to persistence.